Aerotenna has launched a new program to enable educational use of Aerotenna’s sensing and processing technologies. The Aerotenna University Program offers product discounts or loans for students and faculty to support technology and engineering programs at universities across the globe. This program aims to extend students’ fundamental learnings by providing state-of-the-art processing platforms and microwave sensors for practical hands-on experience with building, implementing and testing systems for drone and other robotics applications. 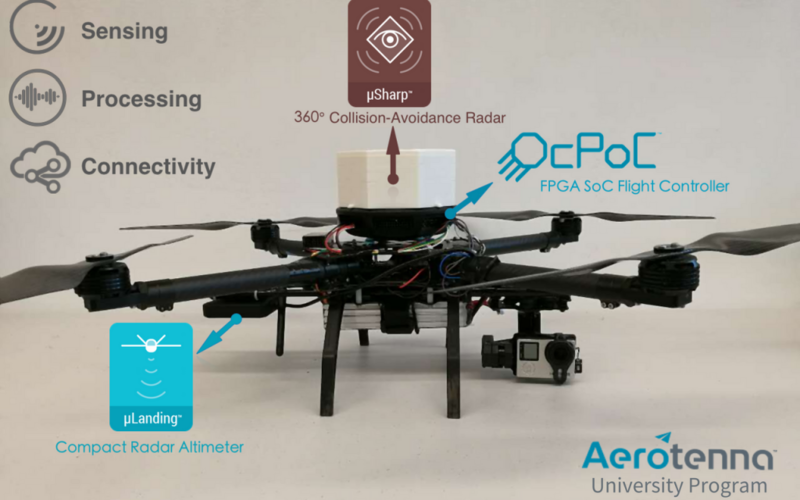 University courses and labs, student projects, and academic research in electrical engineering, embedded system design, flight control and navigation, image processing, FPGA design and other areas can all benefit from using Aerotenna’s OcPoC open-source flight control platform and microwave radar sensors. OcPoC’s SoC FPGA architecture and high performance processing make it an ideal platform for students and researchers to explore more complex applications such as machine vision, deep learning and AI. Its greatly enhanced I/O capabilities enable experimentation and testing of endless combinations of sensors and peripherals. Aerotenna’s robust and easily integrated microwave sensors give students the opportunity to add miniaturized radars to their airborne and land robotics systems to explore more real-world applications. In addition, Aerotenna will provide source code and technical support to allow students to gain a better understanding of the design behind the solutions. The growth of the drone industry and the FAA’s forecast that sales of small unmanned aircraft systems will nearly triple in the next four years have led to an increase in UAV programs at universities all over the world. As a pioneering company in several UAV technologies, Aerotenna aims to support the continuous long-term growth of the ecosystem through enabling the new generation of talent with the best in existing sensing and processing technologies. Learn more about the Aerotenna University Program and fill out an application at https://aerotenna.readme.io/blog/aerotenna-university-program.